The Lydia Desk is undeniably sleek and sophisticated, but still maintains a fun retro flair. This desk makes is a perfect fit for a home office, child’s room or media room -- its simple style fits in anywhere. The Linea’s box-style top offers an uncluttered work space, while angled, gently tapered legs give it great character. The Lydia Desk is undeniably sophisticated, but still maintains a fun retro flair. This desk makes is a perfect fit for a home office, child’s room or media room -- its simple style fits in anywhere. The Linea’s box-style top offers an uncluttered work space, while angled, gently tapered legs give it great character. The Linea is crafted from medium-density fiberboard, which is overlaid with durable and attractive birch veneers. The whole desk is finished in a rich walnut for a touch of traditional warmth. A long open compartment offers storage for books and papers, while a small drawer offers the perfect spot to stash pencils, pens and other small office items. Is the width measured from the end of the legs or just the desk top? 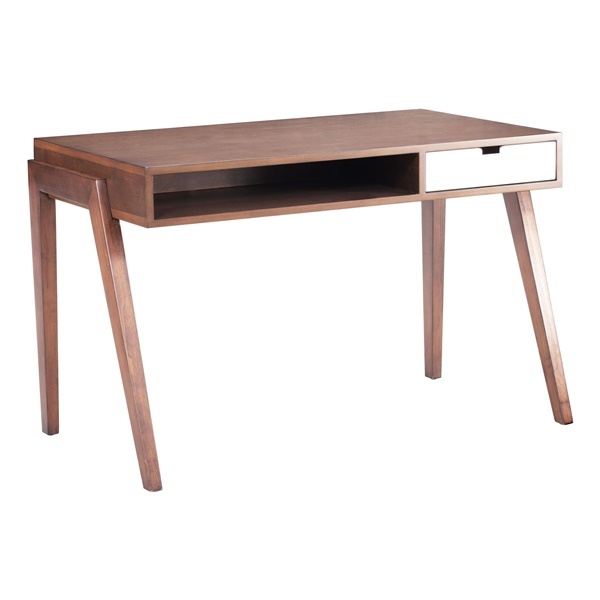 The Linea Desk's overall width of 46" includes the item's legs in the measurement.